Missy from Texas, has told us that she has a serious genetic issue. 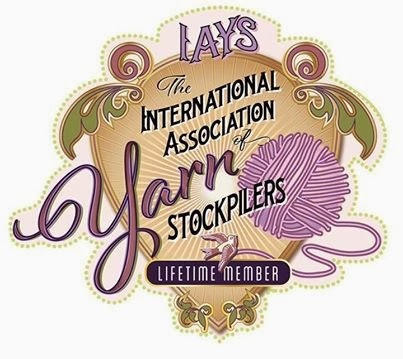 She inherited the yarn stockpiling gene from her mother and passed it on to both her daughters!!!! Missy is very brave to come out and tell the world about her affliction. There is no known cure indeed sufferers appear to relish their affliction. This is a serious issue and we need to answer the following questions. Is this gene active in females and males? Is the centre of disease control aware for this? Is the gene automatically inherited from your parent? Can the gene spontaneously afflict anybody? Can sufferers control the impulse to buy yarn? Are all the afflicted motivated to buy yarn by the same triggers? Is the impulse to buy yarn triggered by colour, texture or some other attribute. For example “the yarn being in a sale discount bin”? Where is all the yarn hidden? Your comments may be be published! Louisa uses her training and skills to create dynamic modern hand knit designs and accessories. Elegant, unique and unapologetically feminine, Louisa Harding’s portfolio of contemporaries and timeless classics have cemented her reputation as one of the UK’s foremost knitting designers. Louisa launched her own range of signature yarns and publications in 2005 and continually updates the range of yarns. Louisa's designs are of true fashion garments, her sense of style is impeccable. Louisa Harding's Etoile, a luxurious cotton rich yarn with a hint of shimmer. Pattern book Etoile by Louisa Harding accompanies this yarn. Knitted Rabbit by our friend Nick. I could not help myself. I enhanced the picture a little. Amitola, a vibrant self striping yarn with the warmth and softness of wool and the luxury of silk. Louisa Harding's Amitola is soft and light to wear. Pattern books accompany this yarn. Louisa Harding's Akiko, a luxurious yarn with alpaca and wool, incredibly soft to wear. Pattern book Akiko by Louisa Harding accompanies this yarn. Noro Kureyon, a classic pure wool from Nora of Japan. With the amazing array of natural colours in Noro Kureyon no two projects will look alike. A truly beautiful yarn. Noro Yarns’ unique textures and colours have no equal. Spun using highly specialised and luxurious materials, each ball or hank of the multi-coloured yarn is individually blended. This blend produces a unique palette of subtle shadings and vivid hues. Such wonderful yarns need beautiful designs to show off their fabulous colours. Noro patterns are simple and straightforward, making knitting as exciting as the unique end result. Below is an extract from the Noro web site, The piece is translated from Japanese. ( Thank you http://translate.google.com/ ) I hope this gives you an understanding of the company's ethos. An interesting, enjoyable and beautiful Noro handknitting yarn. We strive to produce yarn that is natural and gentle to people and nature. We hope our yarn will provide joy and happiness to people who use it. "Noro Yarn" is made to fulfil these dreams. Let us introduce to you yarn created through our persistent desire to provide high quality products. Noro Yarn has always been particular in selecting raw materials from nature. Carefully selected materials are used to manufacture and deliver yarn that does not lose the natural properties of its material. Impurities in the raw wool are carefully removed by hand without the use of chemicals or machines. This process prevents damage to the fibre, though it makes it impossible to remove impurities as completely as chemicals and machines do. To manufacture yarn with the best possible texture that combines softness, lightness, strength, touch, colour, lustre and ease of knitting. We blend several types of raw material, utilizing our deep knowledge of the characteristics of each material. Materials are blended by our original method to avoid damaging the characteristic of each batch, and thus the actual blend ratio may differ from that stated on the label. Colour is the most important factor for Noro Yarn. Colours must be beautiful with a strong lustre and richness of quality. At the same time, they must also be robust to prevent them from fading, discolouring or staining. We have conducted research over many years, continuously going through a process of trial and error. By using an abundance of the highest quality dye, we have attained beauty and durability in the colours of our yarn. The basic principle for Noro Yarn is "Spin yarn by hand" Use machinery only for what cannot be done by hand. This hand-spun yarn is made from finely dyed wool, lined faithfully according to colour and weight, carefully maintaining the slow spinning speed by our crafts persons. Since the human hand is used in the spinning process, the natural lustre and texture are obtained without considerably impairing the wool fibre. Lining up the yarn by hand results in irregular arrangement of wool, thereby giving the yarn more bulk. The features of the Noro Yarn are lightness, softness and loftiness. Please view the thickness of our yarn as an average value. Because it is a handmade yarn with raw materials being weighed and lined by human hands, there are areas that are thick and areas that are thin. There are areas where the strand is tight and where the strand is loose, so please knit gently and discover the joy of knitting Noro yarns. Unlike other yarn, handmade Noro Yarn cannot be continuously spun without knots. The yarn is knotted together in a ball or hank. Please understand that in some cases, there may be a knot or two in your ball or hank of hand spun Noro Yarn. This is an introduction to some of the distinctive features of Noro Yarn. We will continue to concentrate our efforts in the manufacture of products that are gentle to nature and to people. We will continue to strive to make improvements in quality, to develop new products, and to pursue developments in the use of yarn that may be helpful to our customers. We are looking forward to your continuing patronage. Noro Silk Garden 4ply, a stunning combination of colours, with the warmth and softness of wool and the luxury of silk. Patterns can be seen in Noro Favourites pattern book. Noro Kirara, a double knitting wool and angora rich yarn combined with cotton and the luxury of silk. Kirara by Noro, with its amazing combination of colours creates stunning garments. Noro Haniwa, an aran or worsted weight yarn with a luxurious mixture of silk, wool and nylon. Haniwa by Noro is self patterning, its combination of fabulous colours create stunning garments.